CAMP HANSEN, Okinawa, Japan — Marine Corps Base Camp S. D. Butler opened the gates to the Central Training Area, Feb. 19, to students from Ginoza Elementary School for a class field trip. 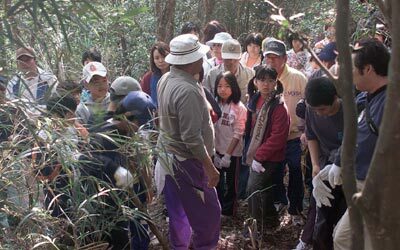 Twenty-seven students and accompanying parents were treated to a morning of hiking through the thick jungle surrounding Landing Zone Dodo, a portion of the CTA, which lies just outside Ginoza Village. The entire sixth grade class from Ginoza Elementary was able to see the harsh landscape within the CTA fence line and develop an appreciation for some of the things U.S. Marines are expected to do when training. The highlight of the field trip was the climb to Gadamako Mountain, which stands at an elevation of almost 300 meters, sitting just north of LZ Dodo. 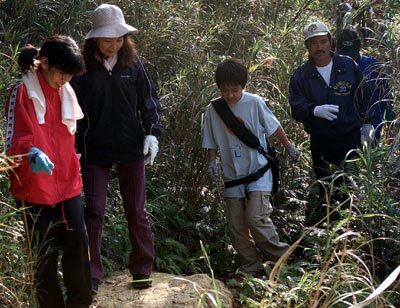 Shoko Chinen, sixth grade teacher, said the hour-long hike up the steep terrain is a trip the six grade students and their parents look forward too. Along the way the students were given instruction from their guide on their natural surroundings and also how Marines use the facility to train. Climbing up the muddy ground while penetrating the scattered clusters of spider webs made the experience more enjoyable for the enthusiastic children according to Chinen. Although the elders struggled to make it to the top, the children within the group raced to the peak as fast as they could. Once at the top, both students and parents took time to rest while taking in the sights of Ginoza Village, its surrounding areas and the horizon of the Pacific Ocean. Chinen said each student was very thankful for the opportunity to climb Gadamako Mountain.